Surprise! Bucking a persistent trend, the 2013 Honda Insight sold in the US has the smallest engine, 1.3L on the gasoline side. The Japanese Honda Insight Exclusive has a 1.5L gasoline engine. (The electric motor is the same on both). When the Honda Insight hybrid first hit showrooms, in 1999, it was a three-door hatchback (I think the term "subcompact" is a poor choice), just 3945mm (155.3 in) in length. Because it only had two seats, it didn't need any headroom in the rear, and the strongly down-sloping roof made its silhouette closer to that of the aerodynamically optimal fish; the US EPA rated its fuel efficiency at an impressive 53 mpg average (61 mpg on the highway). The second-generation Insight, introduced in 2009, had grown to a family car, now with room for five, and 172,3in in length. Its integrated motor assist (IMA) hybrid system gets a quoted fuel efficiency of 42 mpg, but owners report a much higher efficiency. It has been accused of mimicking the style of its hybrid rival, the Toyota Prius, but one could equally argue that the current Insight is a logical extension of the original first-generation two-seater Insight. The 2013 Insight's exterior follows the contours of a more severely truncated fish, so towards the tail the car gets smaller both in the vertical and sideways directions. So even though the car is specified to carry five passenger, the fifth passenger had better be thin in both hips and shoulders. And none of the back seat passengers can be too tall. One Dutch reviewer reports that, even though there is plenty of leg space in the second row, if you're taller than 5ft9in your head hits the ceiling (I'm not that tall, so I wouldn't know). In addition, the back row seats have rather deep sculpting, which makes it harder to install child seats properly. In general, I'm not a fan of sculpted seats, even in the front (why should I have to conform to someone else's notion of what is the ideal bum shape?) 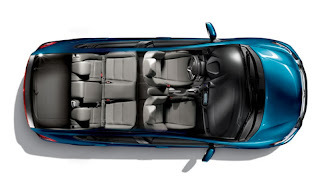 - but certainly in the back, a smooth and flat seat surface makes it much easier to arrange the child seats, especially if there need be three of them. If the people you put in the back seat aren't too tall, and if you're not trying to move too much stuff in the trunk (which is too small for a cello), this car can be fun to drive. A lot of Insight drivers especially enjoy the paddle shifters, which give you a virtual gear shifting capability, usually used to force the engine into a higher rpm for extra juice during merging. My own instinct would be to apply patience rather than pressure on the gas pedal, and to trust the fine continuously variable transmission (CVT) to do its job. The Insight's dashboard is sculpted in plastic with a smooth surface. This might bother you if you're too used to the kind of dashboard that has some relief of small grooves where it's so easy for dust and other debris to collect. I prefer the smooth surface for the minimal surface area from which nasty plastic softeners can outgas, and for ease of cleaning. It used to be that dashboards were metallic, painted in a colour to match the exterior: that's my ideal dashboard, clean and pretty. To me, the real surprise in the Honda Insight is that the US offering has the smallest engine. The Japanese splash page for the Insight Exclusive promises "more" for the extra 200cc, including a trim upgrade - it also costs you distinctly more: ¥ 150,000 ($1600) extra, to be precise. They may have done that to be definitively price competitive compared to the obvious rival, the Prius, which starts at $24,200. The Insight comes with a cushy trim, but does have a smaller engine than the Prius. While its average fuel economy is quoted at 42 mpg, owners have reported a much higher average: 47mpg for the 2011 Insight and 56 mpg for the 2012 model year. But at current fuel prices, even at 42 mpg the Insight will be less expensive to own and operate over the lifetime of the car. * US website shows 98HP for combined power of gasoline and electrical motors. Caveat Emptor. Excellent review. I love my Insight, but it's not because it is some high performance car-it gets me from A to B while saving me money and using less fuel than most other cars. Plugging in my iPhone to charge or play my playlist from iTunes is standard equipment (it should be on every car these days). Let's face it: very, very few of us _need_ a performance car, also known as a traffic ticket aggregator when put to their intended use on public roads.